2016 EU reissue on 180g 2xLP =the 2nd album from The American Rock supergroup formed in 1999 by guitarist Billy Howerdel and Tool vocalist Maynard James Keenan, includes the hits "Weak and Powerless," "The Outsider" and "Blue". 2016 EU reissue on 180g 2xLP =the 2nd album from the American Alternative rock/metal supergroup formed by guitarist Billy Howerdel and Tool vocalist Maynard James Keenan, includes the exclusive extended version of 'The Package' with a running time of 9 minutes 23 seconds long, plus the singles "Weak and Powerless," "The Outsider" and "Blue". 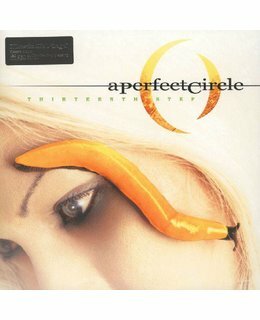 Thirteenth Step is the second studio album by A Perfect Circle. The American Rock supergroup formed in 1999 by guitarist Billy Howerdel and Tool vocalist Maynard James Keenan. Originally released in 2003, the album was certified platinum by the RIAA. Three singles were released from the album, "Weak and Powerless", which topped both the Mainstream Rock Tracks and Modern Rock Tracks, followed by "The Outsider" and "Blue", which also charted on the respective charts.